Are suitable both for clothing and other laundry items including bedding and fabrics in a residential care and nursing home environment. 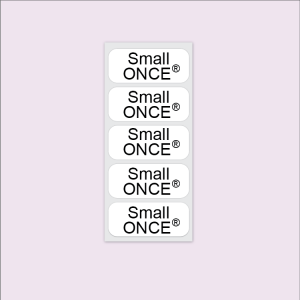 Once applied, these labels become silky smooth and are especially suitable for sensitive skin. Are guaranteed for life not to peel off or fade even after high temperature washes. Just make sure you follow the iron on name label instructions and they’ll stay firmly attached for years to come. Want to save time on ironing? Our ONCE™ Iron On Name Labels only need one application of the iron per label. All our iron on name labels ship the same day (orders before 2pm weekdays) with FREE UK delivery as standard. A LIFETIME guarantee provides peace of mind. Not found what you want? Why not visit The Name Label Company site if you are looking for children's iron on name labels.